For the next volume in the Pantheon series, I will focus on an alien race that lives on the gas giant that orbits the star Arcturus. They acquire the Tree of Life from the Garden of Eden, which causes them to become immortal, as well as transform their entire world into a lush paradise in eternal bloom. 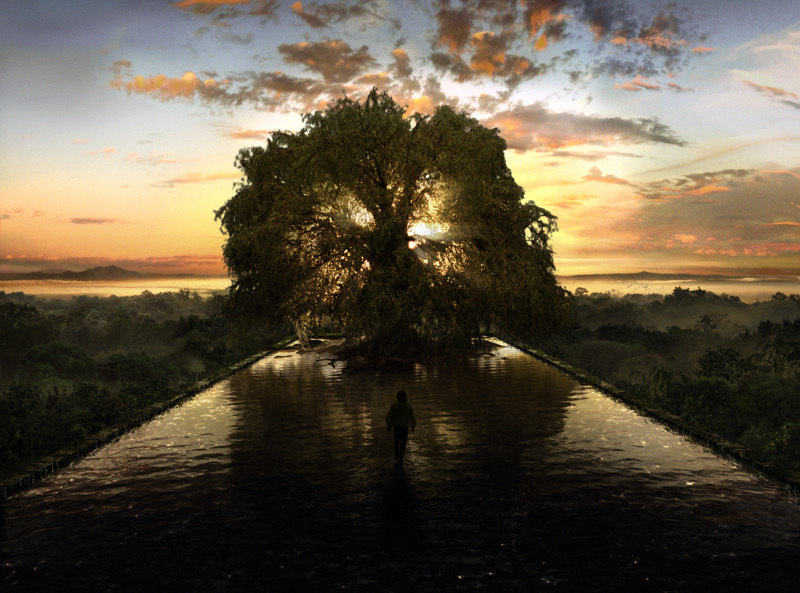 Not only did the Tree of life turn the sentient species Arcturians (of the planet in the Arcturus system) into immortals, it also abolished individuality. A Christ-like figure was responsible for implanting the seed of the tree of life, and gave up his life, only to be resurrected. However, this did not turn him into the son of god, the messiah, for the tree of life actually turned the entire race into a Christ-like symbol. Arcturians, upon achieving immortality, determined the essence of their religion to be eternal and irreducible to a specific history or individual. Religion as an idea could not be historicized or reduced to a particular or expression. Since the idea of religion exists throughout time, yet manifest in different representations, then the essence of the immortals’ religion was an eternal principle that is expressed throughout time/space and instantiated in many ways. Where the Christ like figure was mythical in his expression of the religion of immortality, as god incarnate, the idea or concept of religion expressed non-mythologically or philosophically was the union of their gods & mortals, or the transcendent/individual. This union became realized as Arcturianity as a whole. This humanism or “Arcturianism” substituted themselves for their gods, and their religion became “Arcturianism.” Their God is their entire race, not some incarnate individual. Something greater than a particular self is the collective self. Arcturians found spiritual unity in a sense of being one or connection between individuals. Spirituality is basically the connection between others, and that enlarges their sympathy. The establishment of a union of immortal/mortal established more control over reality and acquires more responsibility for the world. For the Arcturian, religion is a matter of feeling, which is expressed as longing, where the individual longs for something divine, something personal. This longing posits a reality that grants the deepest desires, a nigh-indomitable feeling that conquers all limits of comprehension (faith in providence or confidence of the infinite value of one’s existence, or in miracles, or that gods are more powerful than the laws of nature, and in immortality). Another component of religious objectification is imagination – the original organ of religion. Unlike abstraction, the imagination creates images that affect feelings and emotions. Arcturians are physical beings who require images as vehicles for their dreams & wishes. Also, the imagination complements feelings because it surpasses limits or laws to the contrary. It can transform the immediate and limitless satisfactions of the subjective wishes to something objective. Finally, the imagination can handle abstractions from the physical world better than feelings. It represents, but by clothing abstractions with imagery where thought cannot. Imagination has its limits: once allied with feeling & wishes it can cheat reason by filtering out contradictions and ignore limits It can forcibly switch the abstract with the concrete, which is what happens to pre-Tree of Life religions. The imagination takes the species characteristic of Arcturian consciousness (willpower, thinking, emotions) and mold them into a single and perfect being. Thus the God of Arcturians is the idea of their species as an individual. The doctrine of the God of Arcturians are objectification of the Arcturian predicates, and their religious practices and belief in the afterworld consists of the imaginative expression of wishes & feelings. Arcturians assign to their God the predicates that are the perfections of the Arcturian species. When Arcturians declare that their God is love, then the predicate of love is decisive. However, if love is the defining predicate, and the Arcturian claims that their God renounced his divinity for the sake of Arcturianity, then this is a confession that love is more important than their God. Their savior & redeemer is Love, not God. God as God did not save them, but Love, that which transcends the difference between the divine and the mortal. The Arcturian God renounced himself out of love, so the Arcturian, out of love renounced God. If they do not sacrifice their God to love, then they sacrifice love to God, and despite the predicate of love, they have the God or the evil deity of religious fundamentalism.